Jim, Vee and their three boys moved to Florida in 1999. Originally from Arkansas, where they enjoyed boating, water sports and fishing, the family stumbled upon Marco Island while searching for a home on the waterfront. All it took was one trip over the “Jolley Bridge: for them to know that Marco Island was a beautiful place to live and raise their family. Both Jim and Vee have spent countless hours volunteering in the schools and the community especially with activities for the youth on the Island. Four grandchildren have been added to the crew and upon retirement, the couple bought a store named “Linens Plus” in the Marco Town Center Mall. Soon after they renamed the store “Your Island Home” and expanded the gift and home accent lines, while continuing with the high quality linens. 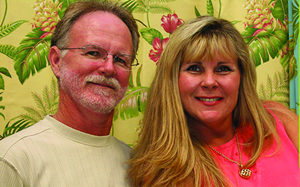 Jim and Vee invite you to see for yourself the wonderful selection of affordable home décor and gift items. Count on a splash of southern hospitality and friendly customer service every time! Shipping is available for most products. Please call: 239.642.7366 or email with any question or your product order. Thank you for visiting Your Island Home web site!